The kosher link up for this month is “The One Food You Would Want If Stranded On An Island” (see below!) It was actually not hard for me to pick the recipe. 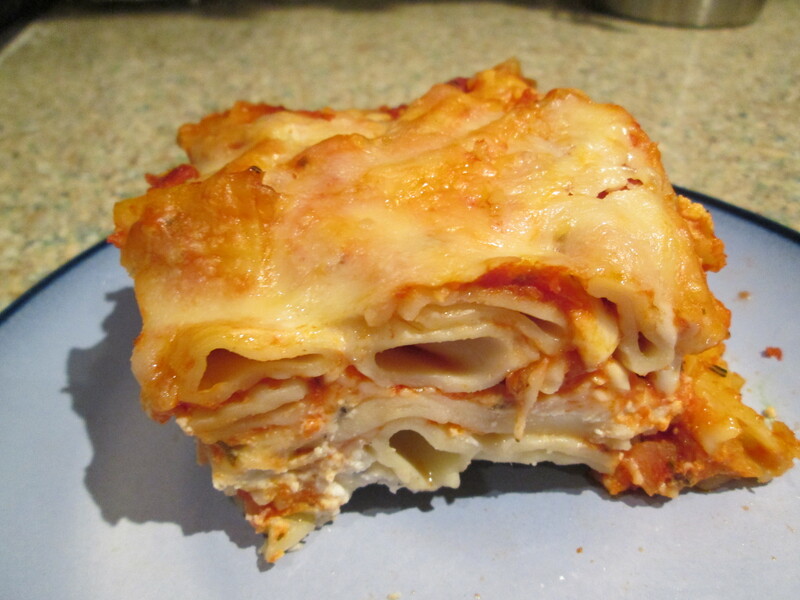 My favorite food is easily Italian – pizza, pasta, ziti, lasagna. I love it all! The best part of Italian food is the red sauce. 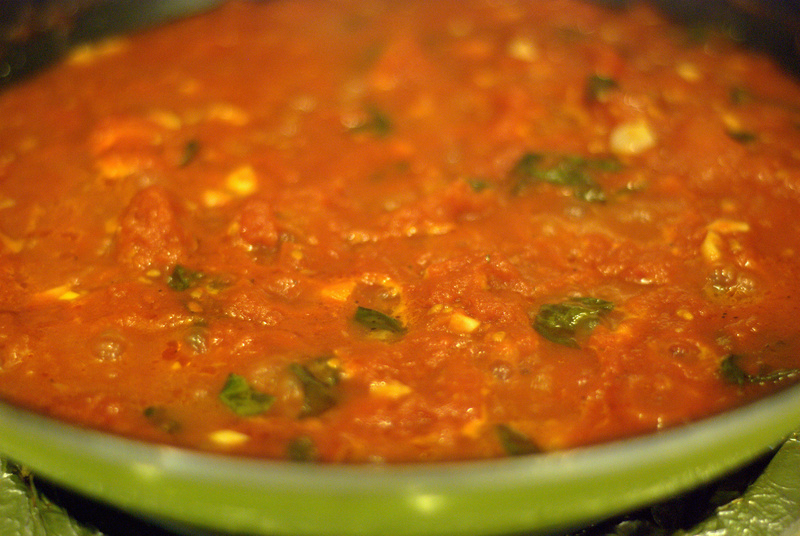 I don’t know what it is about this sauce – the garlic, the tomatoes, the basil. I am not sure but it is a combination that I love and crave. It is also nice in that it is so, so easy to prepare. Once I realized how simple it is to make this sauce I never went back to jarred sauce (many have a lot of sugar, salt and/or preservatives). That and my husband grew up in Brooklyn and eating jarred sauce is blasphemy. Hopefully, once you try the recipe you will feel the same. Being that I make this once a week I try to make it as healthy as possible and change it up. 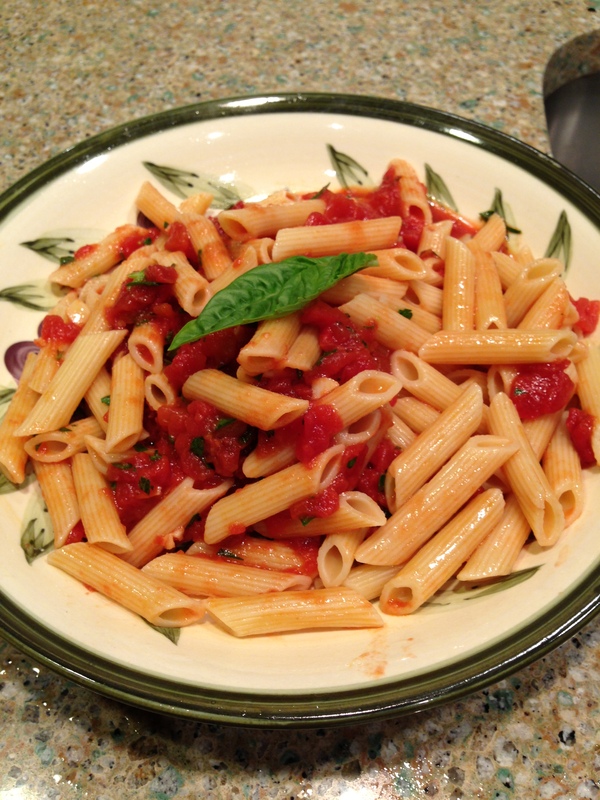 I will use a high fiber/high protein pasta, a whole grain pasta or a vegetable fortified pasta. I will make it with meatballs or add ground meat, onions, mushrooms, eggplant, or anything else I have in the fridge. It is a great base sauce and is also delicious on its own. In a large skillet add olive oil, garlic and red pepper flakes. 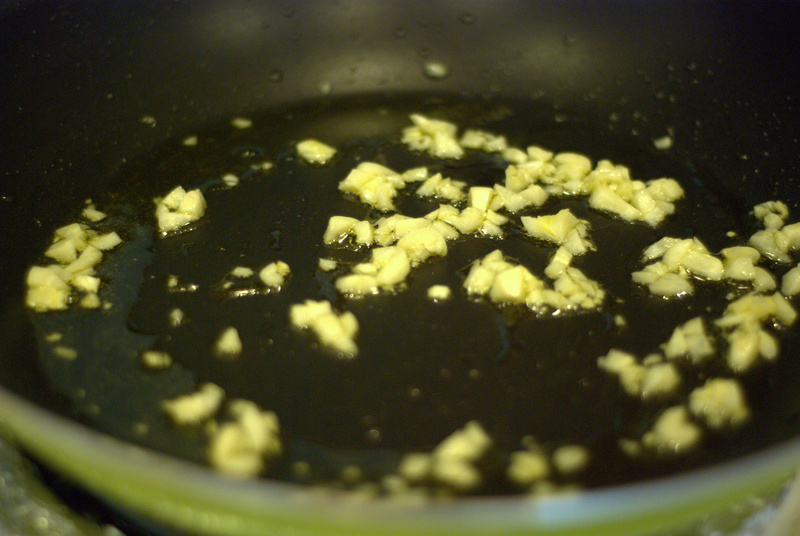 Sauté over medium heat until the garlic has softened, but not browned about 2-3 minutes. Stir in the tomatoes and basil. Season with salt and cracked pepper. Reduce heat to low and let simmer for 15-20 minutes. Cook the pasta in a pot of heavily salted boiling water according to the package directions, or to al dente. Drain pasta. Toss the pasta with the sauce. Garnish with torn basil leaves and chopped parsley. Today is the end of Passover 2014. For those of you who are not aware, Jewish people are not supposed to eat anything that is leavened (called chametz) during Passover. No bread, no pizza, no bagels, no pasta – no fun! It is a nice holiday and I can appreciate the traditions, but anything that takes me away from my favorite foods for eight days is tough. The kosher link up for this month is chametzfest – the celebration of getting to eat chametz again (see below!) Since I have been a young child my tradition is to eat Italian food once Passover has ended. Pizza and/or pasta is always on the menu. 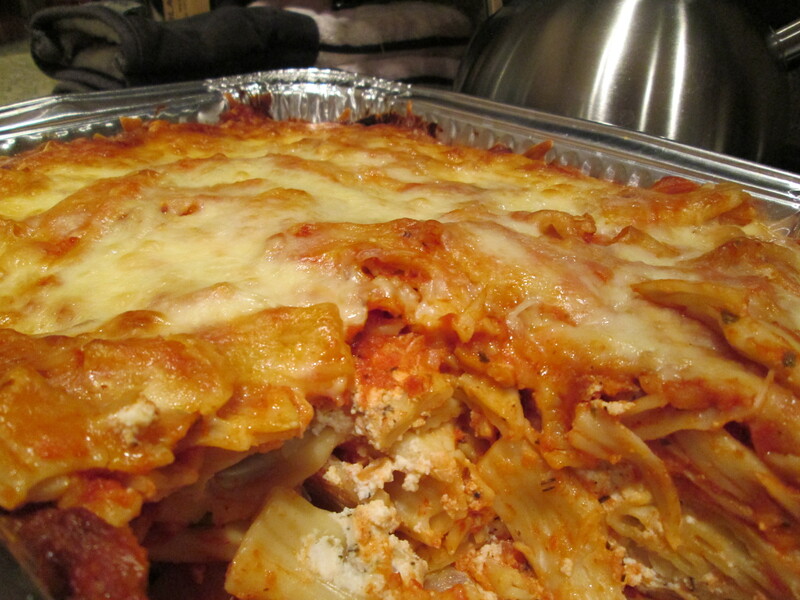 For that reason I decided to share one of my favorite pasta recipes – baked ziti. This recipe is great in that it is quick, easy and feeds a ton of people! It can be easily doubled to feed two tons of people. Using a jarred sauce saves time, although you can always make your own. 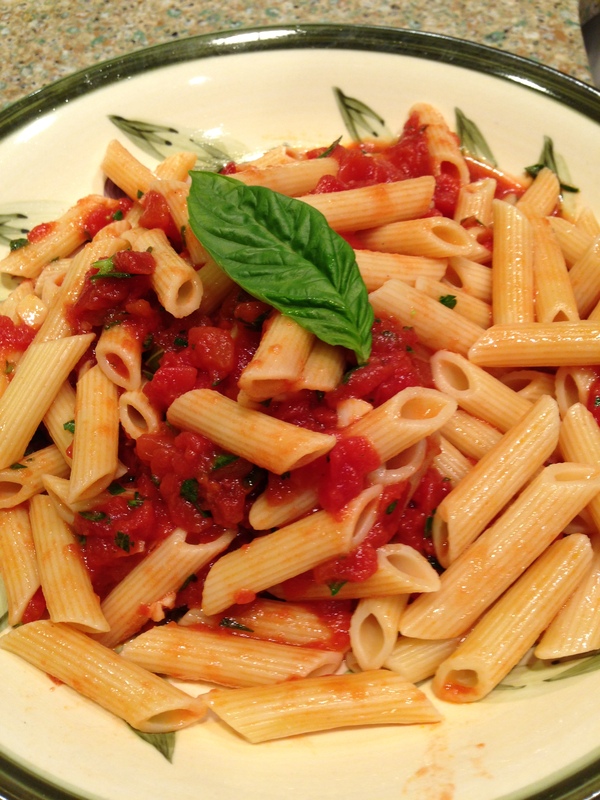 I use part-skim ricotta and mozzarella cheeses to make the dish a little bit lighter. Since the ricotta is seasoned so beautifully you never miss the full fat version. I use a foil backing pan so clean up is a cinch. It is good enough to serve for company and a nice treat for a family dinner. Leftovers are delicious the next day or day after. You can also make this the day before you plan to serve it, put it in the refrigerator and then bake before eating. Preheat oven to 350 degrees F. Cook the pasta in a pot of heavily salted boiling water according to the package directions, or to al dente. 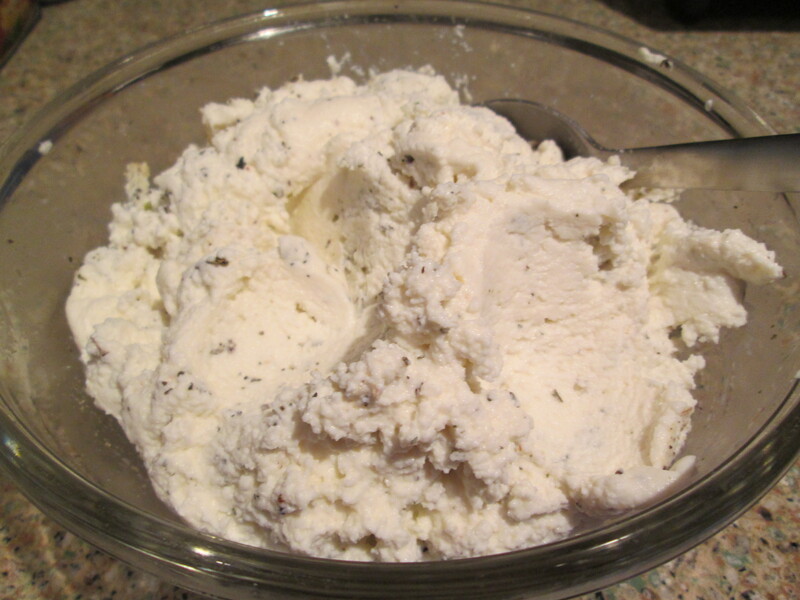 While the pasta is cooking combine ricotta cheese with garlic powder, dried basil, oregano, salt and pepper in a bowl. Mix well. Drain pasta into a colander. 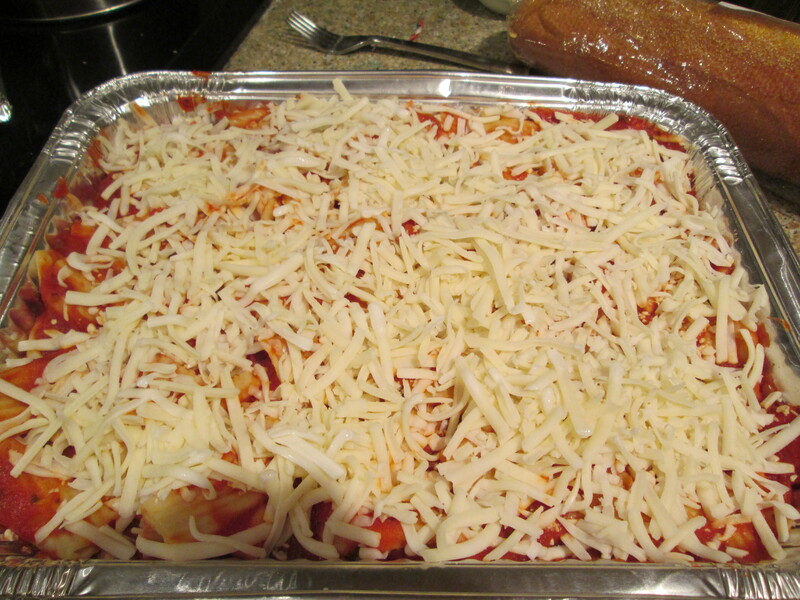 In a deep baking dish or foil pan place a thin layer of sauce at the bottom of the dish. Create a layer of pasta using approximately a third of the ziti. 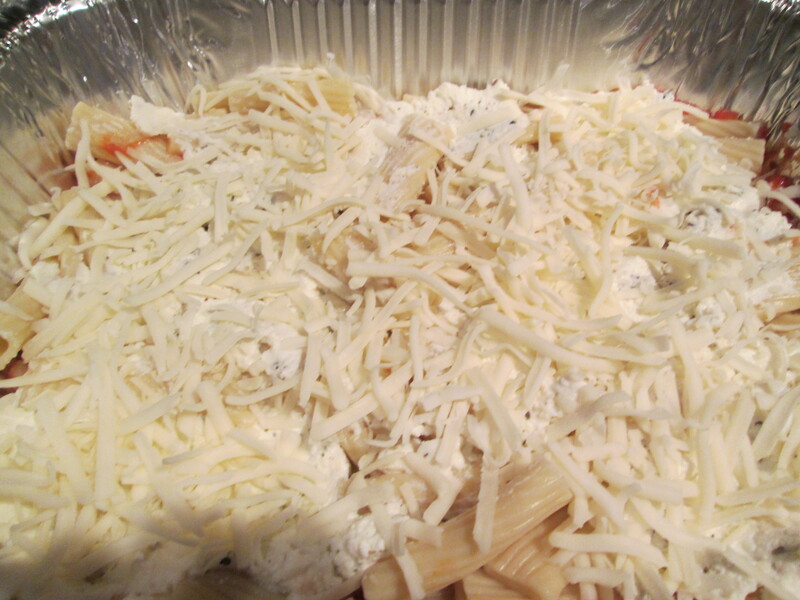 Spread half of the ricotta mixture over the pasta then add one third of the mozzarella cheese. Add a thin layer of the sauce. Repeat one more time. For final layer add one third of the pasta, a layer of sauce and one third of the mozzarella and all of the Parmesan cheese to the top. If you are looking for an easy vegetarian dish this recipe is for you! We only eat meat once or twice a week so I am always on the lookout for satisfying meals that are meat free. This one is a go-to because it is healthy, filling and tastes great. I use whole wheat spaghetti to add protein and fiber. I use frozen vegetables (broccoli, peppers or a veggie mix) to cut down on the chopping time and tofu to add lean protein. I use frozen vegetables as this is a common week night recipe for me and my time is very limited. You can always add fresh vegetables if you wish. I put the tofu as optional because a lot of people think that they do not like tofu. I recommend at least trying it once in this recipe. The sauce is so flavorful and the tofu just tastes like the sauce. Even my husband who swears he does not like tofu will eat it in this dish. It is great, hot, room temperature or even cold as leftovers! Prepare the spaghetti according to the package directions. Drain. While you are waiting for the water to boil and the spaghetti to cook, sauté the tofu in the sesame and canola oils in a large pan over medium heat. Add the chopped garlic and ginger, red pepper flakes and stir. Then add the scallions and sauté until tofu starts to firm up, about 5 minutes. At this point you can throw in the fresh or frozen vegetables. Cook until the vegetables are tender, but not soft. Pour in the soy sauce, red wine vinegar and the peanut butter. Add 1/2 cup hot water and stir the mixture. Keep adding peanut butter until you get a thick sauce consistency and cook until melted. Add hot water if needed to thin out the sauce. 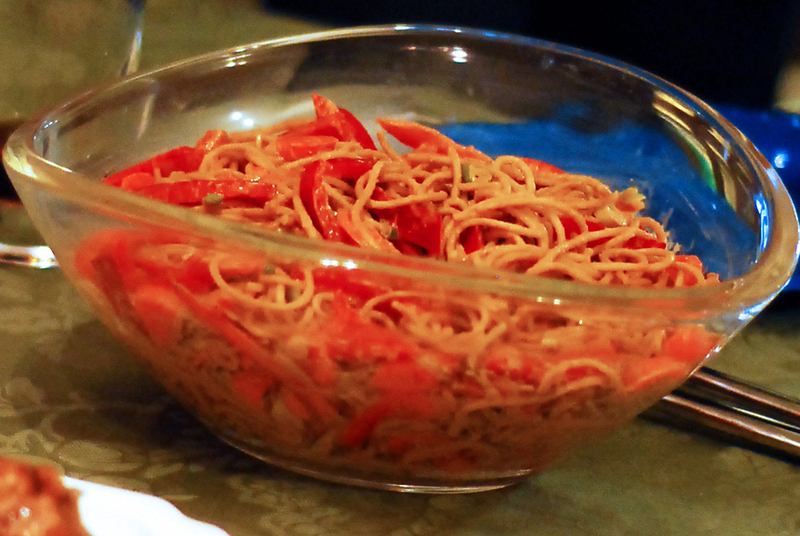 Toss the pasta with tofu mixture and sauce until well combined.